Quiltville's Quips & Snips!! : Show & Share in Arizona! She gives a BIG thumbs up at the completion of Celtic Solstice, last year’s Quiltville Mystery! She did such an excellent job on this….she deserves all the thumbs up we can give her as this quilt is not for the faint of heart and in the quilting scheme of things, she is a relatively new quilter! Angela’s Moth in the window top in progress! Moth in the window appeared in a past Addicted to Scraps column, and my setting of this quilt will be appearing in my next book….look at the positive negative color play within this top….SO much fun! And Grand Illusion top is done! Leader & ender Lozenges are also done! I love seeing how quilters are powering through and reaping the rewards of using units as Leaders & Enders in between the lines of the sewing they already have going. My Lozenges are still in progress…let’s face it, I’m spending so much time on the road, my own sewing time has been diminished greatly. I WILL get back to it!! My friend Tonya Ricucci did a tutorial and challenge for the Legos quilt back a few years ago ---this one is Joyce’s! How many pieces do you think are in this? It’s AMAZING! 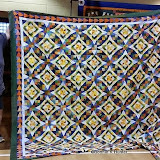 There were so many wonderful Show & Share quilts that I have uploaded them into a slide show for your perusal. Click the image below if you are unable to view the slide show on your mobile device. You’ll be taken to the photo album for viewing. Yesterday was the best relax day I could have had. I caught up on email. I walked and enjoyed the beautiful surroundings and nature, soaking up sunshine in my shirtsleeves---oh, just feeling that bit of sunshine on my face was just AMAZING. I sewed hexies until I couldn’t hex anymore while enjoying the company of my dad and watching whatever HE wanted on the TV. Good thing we pretty much have the same taste in what we like. The Roosevelts. White Collar. Downton Abbey capped off the end of a much needed do-nothing day. This afternoon we have plans to run some errands, drop off remaining books at fedex, and work our way over to my brother’s house where I’m staying tonight to spend some time with them…need some time with my nieces who are growing way too quickly! And hoping for more walks in the Arizona sunshine ---perhaps a trip to the arboretum? Whatever we get up to, I’m drinking it all in! What a wonderful selection in these beauties. The Grand Illusions in different colors are tremendous. Enjoy your time with the family. Love Arizona. If you haven't visited the Desert Botannical Gardens, that's a great option too. This is a great time of year to be outdoors in AZ. Treasure your family time, especially with your brother (hope he is doing well). It's raining in Tucson this morning - the desert smells fabulous after it rains. For you down time with your dad must be extra special. How nice that you can fit family visits in with your work!! Thrilled to hear you are having some down time and visiting your Dad and Brother and his family. I can just hear the comments the nieces will make in the future about their "Auntie Bonnie"
You're making memories that are precious. Inquiring minds still want to know about the Pickle Ball. Love the quilts as always. Enjoy your time in the sun. Just wanted to share with Truly Blessed that if you google pickle ball there is quite a lot of info. Good to see I'm not the only one who quilts without shoes. Seems to me there is a lot of piecing and quilting going on in AZ! The quilts show was a real upper. Have fun, laughter a lot and rest when you can. Hello--I saw the Grand Illusion finished. Beautiful!!! !